A Great Gatsby Lawn Party. Now, if that isn’t a great idea for a sizzling summer event, we don’t know what is. It would be an event that blends something quintessentially British – a garden party – with the very best of 1920s America and the Roaring Twenties. From event planners to private individuals, one of the biggest challenges of organising an event is how to make it just that little bit different. Doing things differently is always high on the wish list when it comes to event planning. The problem is we often fall back on what we know. We stick to tradition. There’s nothing essentially wrong with either of these approaches, of course. However, if you want an event to be something that will genuinely live long in the memories of your guests, if you can make it different – even unique – you are onto a winner. Lawn Parties: The next big thing? We have to come clean. A Great Gatsby Lawn Party wouldn’t be completely unique. They have been done before, but at the moment they are very much an American thing. This is fair enough. After all, when we think of The Great Gatsby and the Roaring Twenties most people think of the USA. If you do a Google Search on 1920s lawn parties you would discover that there is very little evidence of UK events. Here at The Jazz Spivs we reckon they are sure to catch on over here in Blighty. But for now, a Great Gatsby Lawn Party would make you a trendsetter and show that you are one step ahead of the game. The Jazz Age Lawn Party is a summer tradition held annually on Governors Island, New York. You can also take further inspiration from the Roaring Twenties Lawn Party that took place last summer in Ipswich. That’s Ipswich, Massachusetts, not the one in England. The finer details of your Great Gatsby Lawn Party are yours to choose. You’ll need to decide upon the scale of the event. You won’t be short of great ideas though. And the fantastic thing about such a theme is that it is so versatile. A corporate summer event perhaps stands out above the rest, but it’s by no means the only option. A lawn party would be ideal as a bumper birthday or anniversary celebration, for example. Or, how about a Great Gatsby themed summer wedding? The Charleston, cocktails and champagne probably need to feature somewhere along the line. Dancing and dance lessons are bound to be popular. 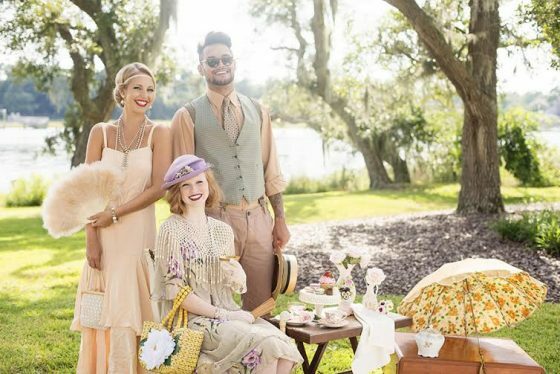 From picnics on the lawn to lounging in the sun in full 1920s attire, there are many ways to get that Gatsby theme going. Once nightfall descends, fireworks are almost obligatory. Live music has got to feature too really, hasn’t it? The Jazz Spivs know a thing or two about live music, and the 1920s and Gatsby is our speciality. You can get in touch with us here to find out more.